Scribings Vol 4: Miscreations paperback now available! The paperback edition of Scribings, Vol 4: Miscreations is now available at CreateSpace and Amazon. The ebook edition showed up at Scribd, so if you have an account there you can read the whole book today. Giveaway ends August 15, 2014. See the giveaway details at Goodreads. 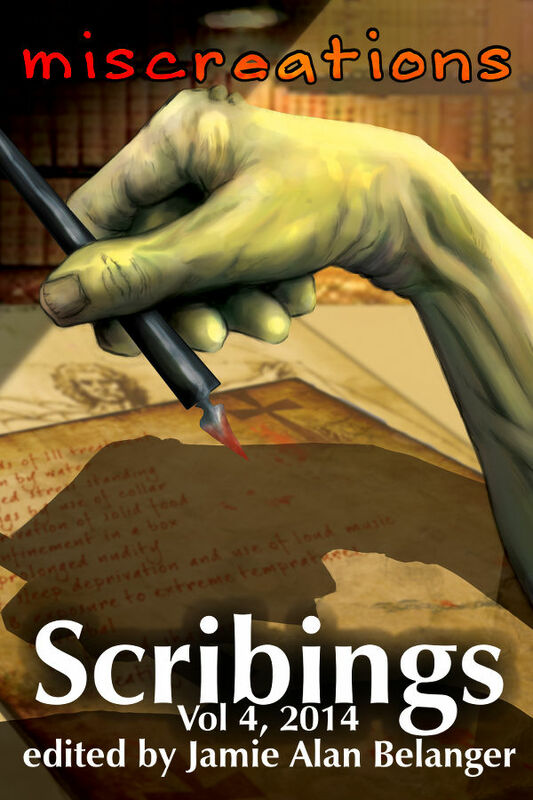 Scribings, Vol 4: Miscreations ebook now available! This morning we published the ebook version of Scribings, Vol 4: Miscreations in the Smashwords and Kindle stores. I and the other members of the Greater Portland Scribists have been working hard on these stories for months, and we're overjoyed to announce that they are finally ready for publication. It's been a long road, and we delayed the publication several times, but our reason was understandable: there's a lot here. With twelve stories weighing in at just over 85,000 words, Miscreations is our longest anthology yet. So, while we missed our usual June release date, we feel the extra time spent on these stories was worth the delay, and we know you'll feel the same. If all the world's a stage, is the next act about to start? They're just a bunch of smart assets. Sometimes, hate is just a tool. Birthdays, a timeless tradition, can bring up all kinds of issues. He's fighting for tradition; she's fighting for survival. Legends don't die... They're born. What you see might just re-make you. Family and identity gain definition by blood, bonds, and broken souls. Winter storm warning: a change is on the wind. Morality is no laughing matter. ...and Hell is eager to send him back! The ebook is currently available at Smashwords and the Amazon Kindle Store. Other ebook stores will carry it in the coming two weeks or so. We are also making a paperback of this volume, which should be ready later this month.